Daily Spirit & Word, 596: It’s Just Too Good to be True. When they heard that Jesus was alive, they DID NOT BELIEVE IT. Good morning my friends. Many of us have friends and relatives that just don’t seem to want to believe in Jesus the way that we do. We often find it difficult to understand why. Why won’t they believe in Jesus? Perhaps one of the reasons might be this one, the fact that it is just too good to be true. Note from the verses above: The Disciples, the followers and students of Jesus teachings, were mourning and weeping. Why? Because they’d just witnessed three days beforehand their LORD and Master and Teacher being put to death by the Romans upon a cross. They’d watched Joseph of Arimathea taking charge of Jesus’ dead body, wrapping it in a cloth and taking it to a tomb and putting a great stone in front of the tomb. To them Jesus was definitely dead and gone, now they were doing what every one of us would be doing if someone that we loved, cared about, trusted and depended upon had died: They were weeping and mourning. It’s just too good to be true that our beloved would come back from the dead. Many people find death so difficult to accept that they believe they can see and hear their loved ones, long after the event, until time and reality hit home and they accept the fact that they’ve really gone. I’ve known widows who, because they’ve been with someone for many years, have whole conversations and then suddenly realise “Ahhh, he’s not here”… No, it’s just too good to be true to believe that he would be. Too Good To Be True? It’s fantastical, crazy, foolish even, to believe the good news. Some people actually think that you are MAD to believe that someone could come back to life after death. That’s why the Word of God, the Bible admits that the GOSPEL is foolishness to those who don’t believe. So how can we possibly ever convince those that we love, who find it hard to believe, that Jesus is ALIVE and can be known today? I’ve known far too many people who’ve become convinced of this central truth of Christianity to doubt it. Even if I had not experienced the resurrected Jesus for myself, the evidence of the many could convince me of it. History, and even recent history in Iraq and Syria revealse the sincerity of their conviction, even going to point of being prepared to die with joy in their hearts, rather than renounce their faith and trust in the resurrected Lord Jesus Christ. However, sincerity alone will not move, convince or convict everyone to accept the truth. Thankfully, we don’t have to believe in the resurrection first, we’ll become convinced of it later on though, once we’ve got the resurrected Jesus in our life. It is after we KNOW HIM that we become like those who could never renounce their faith. To renounce Jesus after knowing Him would be like saying, “I came into this world without a mother or father”… It’s IMPOSSIBLE to say we don’t believe in Jesus, we’d be lying. 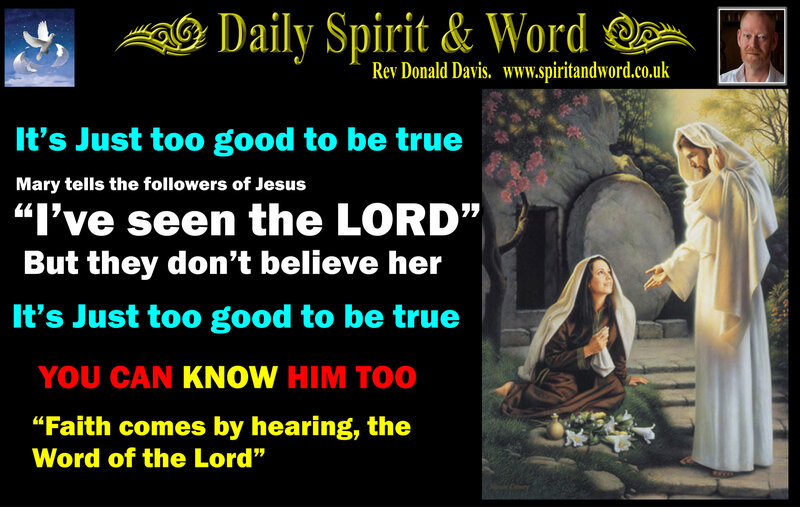 Once Jesus comes into your life, then you too become a witness like Mary Magdalene, and just as she found that those who even loved Jesus found it hard to believe, we too will find it almost impossible to convince people about the resurrection of the Lord from the dead. Praise the Lord though, because He’s given us a KEY to open up those barricaded minds and locked up hearts. To get us to that point of Belief: God’s Holy Spirit first convinces us of our need of a Saviour. He first uses God’s Law to do it. God’s Law (the Ten Commandments) are like a Schoolmaster / Instructor to lead us to a knowledge of our need of a Saviour. Because without a Saviour we’re doomed to be judged by God’s Law for our sins. Because we’ve ALL broken His Commandments. We’ve lied, stolen, coveted and lusted, we’ve not put God first, every day of our lives. God’s revealed in His Word: the punishment for liars, thieves and those who lust or covet; death and Hell. Even if we’d only broken ONE of His Commandments, we’d become guilty LAW Breakers. Once we know that God would be just and right to punish us for our moral failures, we are ready for the Good News: Faith comes by hearing and hearing by the Word of God. God’s Commandments show us what we are like and the Gospel shows us what we need to do to be made right with God. When a person is convinced of their need of a Saviour, they are ready to hear the rest of the Good News. FAITH to believe; but believe what? God gives us the gift of faith to Believe that Jesus Christ, God’s one and only Son, came to die upon the Cross for the sins of the whole world and three days later to rise from the dead and then ascend into heaven. He gives us faith to believe that Jesus died in our place for our own sins upon the Cross. He enables us to know that we need to repent and turn away from our life of sin to Jesus Christ and to receive Him as our Lord and Saviour. From that point on, once we’ve repented of our sins and received Jesus as our Saviour, we’ll know HIM and become totally convinced of the fact of the resurrection, because Jesus is alive in our own life. We KNOW the Saviour personally. Jesus, through the Holy Spirit, gives us NEW LIFE: We get born again by God’s Holy Spirit once we repent and receive the Lord Jesus. Without repentance there is no remission of sins. Until we receive Jesus by faith, we’re dead in our transgressions and sins and await God’s righteous judgement. Have an awesome Tuesday with Jesus your Saviour. Imagine the JOY that those followers felt when they discovered that what Mary was telling them was TRUE. Then they KNEW as everyone can today, that it may seem “Just Too Good to be True”, but it is TRUE: Jesus is ALIVE TODAY and we can all know Him personally. Don’t keep trying to tell or convince people that Jesus rose from the dead, they’ll just laugh at you and think you’re mad. It’s like casting your pearls before swine. Instead, use the God given KEY to open their locked-up hearts and set them free from unbelief: The Law of the LORD is perfect converting the soul. The Law (Ten Commandments) can open up previously locked-up hearts, hard-to-reach individuals who find that stories of the resurrection are just too good to be true. Once they know their need of the Saviour, God will use that knowledge to give them faith to believe in His Son. Faith really does come by hearing God’s Word: It is sharper than a two edged sword. It cuts right to the heart and converts the soul. Next PostNext Lean On ME, when you’re not strong.